This comprehensive volume advances heterodox reconstructions of agrarian Marxism on the occasion of Marx’s 200th birth anniversary. While Marxists have long criticized ‘populists’ for ignoring capitalism and class, populists have charged Marxists with historical determinism. This ongoing debate has now reached something of an impasse, in part because new empirical work addressing the complex contemporary patterns and conjunctures of global agrarian capitalism offers exciting new horizons, along with new and generative theoretical reconstructions of Marxism itself. 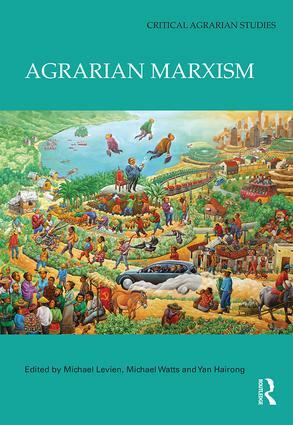 This book helps to point the way beyond this impasse, and illustrates that agrarian Marxism remains a dynamic theoretical program that offers powerful insights into agrarian change and politics in the twenty-first century. This book was originally published as a special issue of The Journal of Peasant Studies. Michael Levien is Assistant Professor of Sociology at Johns Hopkins University, USA. He is the author of Dispossession without Development: Land Grabs in Neoliberal India (2018). Michael Watts is Class of 63 Emeritus Professor in the Department of Geography at the University of California Berkeley, USA. Yan Hairong teaches in the Department of Applied Social Sciences at Hong Kong Polytechnic University. She is the author of New Masters, New Servants: Migration, Development, and Women Workers in China (2008), and co-author of The Chinese are the Worst? : Human Rights and Labor Practices in Zambian Mining (2012) and China in Africa: Discourses and Practices (in Chinese, 2017).